The work being done by our Capital Projects Department throughout the park has developed quite an audience these days. 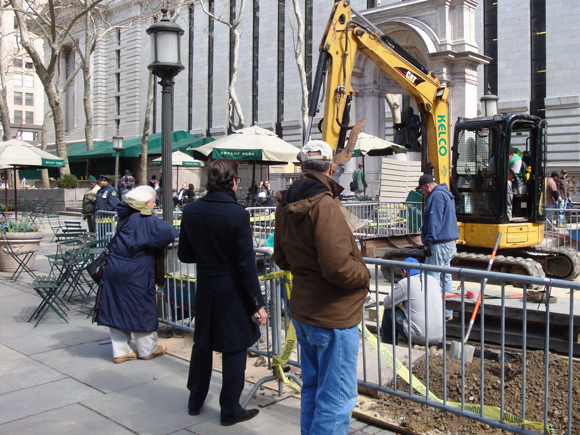 A number of construction-related projects are in progress (with a few more in the pipeline) to prepare for the park's busy warm weather season, including digging conduits to run power across the Upper Terrace (near the Bryant Park Grill) and re-paving the section since the bluestone had been damaged from events and heavy foot traffic. The new power runs will benefit the Capital Department's lighting upgrade for the entire park by connecting the Upper Terrace light poles to the rest of our lighting system (Upper Terrace lights are currently controlled from inside the restaurant). In later months, new lights will be added to the area to enhance the Gertrude Stein and William Cullen Bryant monuments. We'll keep you updated. As for this new spectator sport, you might want to give it a try. 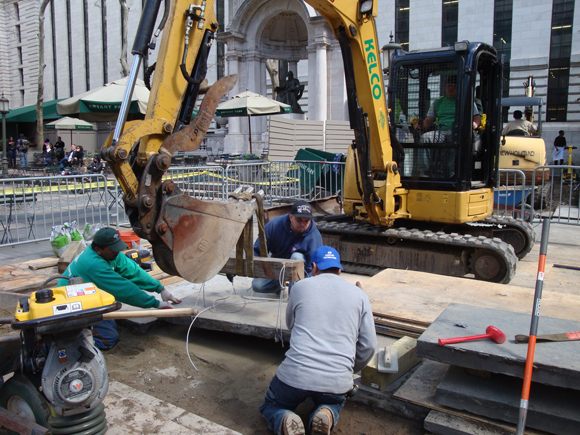 It is pretty interesting to watch three men and a crane place 1,500 pound slabs of bluestone down like puzzle pieces. 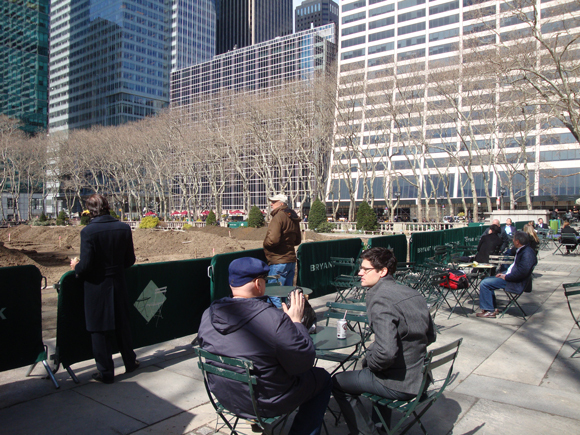 And the lawn, the crown jewel of Bryant Park, always has an audience no matter what stage of installation it's in. I wonder if all the people watching the work are just imagining a beautiful sea of green in its place?